Maliau Basinor also Maliau Basin Conservation Area, is a region in Sabah, Malaysia.This 58,840hectare pristine rainforest, also known as Sabah's Lost World is a huge bowl of the few remaining relatively untouched wilderness areas in the world. Bounded by a formidable escarpment reaching over 1,675m above sea level, the almost circular Basin, one of Malaysia's finest remaining wilderness areas, encompasses 390 km² of pristine forest, a virtually self-contained ecosystem, never permanently inhabited and with large areas still remaining to be explored and documented. 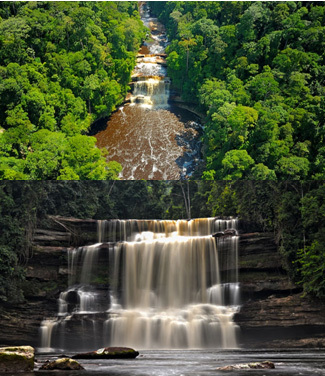 The whole Basin is a single huge water catchment, drained by a set of radiating tributaries, one of which descends to 28meters height,7-tier waterfalls, known as Maliau Falls. From here The Maliau River then drains through a gorge out of the southeast of the Basin into the Kuamut River and eventually to the Kinabatangan river, Sabah's largest and most important river. Recognizing the uniqueness of the area, in 1981 Yayasan Sabah voluntarily designated Maliau Basin as a Conservation Area, for the purposes of research, education and training, along with Danum Valley Conservation Area further to the east. In 1997, Maliau Basin Conservation Area was upgraded by the Sabah state government to a Class 1 Protection Forest Reserve, providing legal status as a protected area, and extended to its present size of 588.4 km² by incorporating forested land to the east and north of the Basin. Buffer zones surrounding the whole Conservation Area also add to its protection. The Sabah State Government has approved the World Heritage Site (WHS) nomination of Maliau Basin together with Danum Valley and Imbak Canyon as a single heritage site which will be called DaMaI, an abbreviation of Danum Valley, Maliau Basin and Imbak Canyon.